Casa Chanty is a spectacular Vacation Home in Caribbean style perfect for families and friends ,Playa del Secreto is a peaceful secluted beach location for the exclusive benefit of the guests who rent the Vacation rentals in this area. We count with a security guard service at the entrance of Playa del Secreto 24 hours . Casa Chanty is a wonderful beach house with 2 apartments that are rented separately and totally independent one on the ground floor and one on top. The 4 Bdrs "Penthouse" is on TOP floor (sleeps 9) offering a breathtaking view of the Carribean sea and the beach, through a circular glass front wall that allows amazing 180 ° views. The long spam of white sandy beach in front the house is secluted and for this reason everyone can really enjoy it . The spacious modern kitchen, with dining and living room is an Open space with sliding doors onto the terrace in from both kitchen and living room from where you can enjoy a breathtaking view of the carribean. The kitchen has everything you need and not miss anything. All the rooms have AIR CONDITIONING and ceiling fans. although after years of experience I can say that the place is always discreet and quiet, no one disturbs anyone the beach is deserted therefore the peace and the beauty of the place are the top. 50% deposit requesting by paypal upon confirmation. Welcome in this magic Location at Casa Chanty Riviera Maya Mexico. because is perfect and has all you need for a perfect vacation & specially for all the people who like to wake up and enjoy the impressively sunrise over the sea , ranging on a deserted stretch of white sand to the horizon, enjoy a free and unique for themselves, the contact with nature and tranquility of this place are what make it unique and so special, for our guests, they all say that exceeds their expectations and that the photos online can not really reflect the real beauty of the place. Casa Chanty is right on the Beach Ocean Face, less than 10 meters distance to the water. 2 kayaks 1 paddle board some boogie boards are available for use. There are many reasons to appreciate this property. We were a group of 7 adults - family and friends - who wanted to relax, enjoy one another's company in a location removed from the more usual activities and crowds of this part of the world. We walked the beach, swam in the surf, tried the kayaks and soaked up the sun. We cooked, read our books, played lots of scrabble and card games and took the occasional trip for groceries or a restaurant meal. The penthouse and loft accommodated us well. The design of the apartment allows for exceptional sea and sand views and the feel of the place is comfortable and unpretentious. Damien dealt quickly with any minor problems and looked after the housekeeping and Alberto's three dogs kept us entertained. A great two week break from a Canadian winter. Highly recommend. We stayed here from March 16-23, 2019 and had a mixed experience. THE PROS - access to a perfect beach, and I genuinely do mean perfect, with gorgeous turquoise water and a fantastic outdoor space including a pool, lots of places to lounge outside, plus two kayaks and a paddle board to use freely. We always felt safe in our rental and had a great time in nearby Puerto Morales for lunch and dinner. THE CONS - upon arrival the penthouse had many fruit flies (30-40) probably because both sets of patio doors don’t fully close, leaving slightly less than a centimeter gap (a tiny lizard even got through when the doors were closed), the bathrooms had an unpleasant odor all week, the beds weren’t very comfy and the two common-area AC units were not functioning. A cleaning service is supposed to come 3 times a week; they only came once which was plenty for us, yet the kitchen was a little grimy even after being cleaned. One of our main reasons for renting here versus a resort was for privacy. There weren’t any other renters the week we were visiting, so the only people there were the property manager, and one day, ten of his friends. Overall, we really enjoyed the beach, the ocean and the nearby town but we probably wouldn’t stay in this particular rental again. That said, we like to be home-bodies, or rather, beach-bodies on vacation so having a really nice place could be more important to us than it might be if you’ll be spending more time out and about. Casa Chanty was the perfect place to spend a family vacation. The beach is beautiful and the house had everything we needed. Alberto was always there when we needed him and he was extremely helpful with everything. We would definitely stay here again! So much to do in the area, the house is in a great location. We hope to come back next year. The staff is very friendly and work hard to keep place in great condition! THANK YOU! THANK YOU!! We recently got back from Casa Chanty we spent a wonderful week with my children at this beautiful house!! the pictures in your web site are exactly how the house is! We enjoyed the Beautiful beach with the kayak and love dipping in the swimming pool. We enjoyed nightly card games at the table outside and loved having Wally the dog around to play with!! A big thank you to Alberto who helped us when we needed to order out!! What a great guy!! If your thinking about visiting Casa Chanty, I say YES!! We will definetly be back!!! It really lives up to the description and photos. The ocean water is clear and this property has some of the best beach front in the area. The house is lovely and has great views. We were two families who split the penthouse and it was plenty of room for all seven of us. 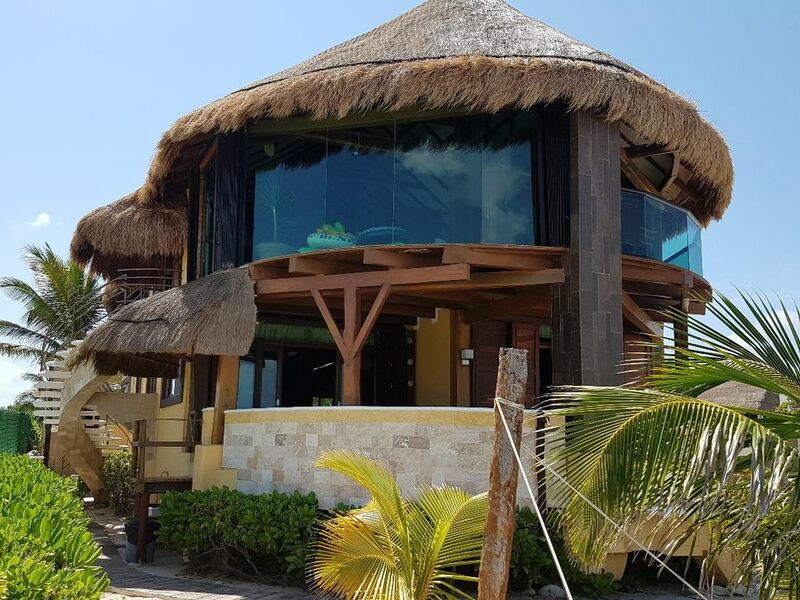 perfectly located between Cancun 20 minutes , & Playa del Carmen only 10 minutes drive ,and only 5 to puerto morelos , make of this location the perfect start of point for all kind of excursions. Golf: The Mayan Rivera is the fast becoming a world renowned golf destination. Casa Chanty as close as Five to Twenty-Five minutes from best golf courses.